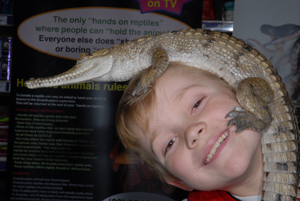 Snakebusters - Testimonials for Australias best reptiles, Melbourne, Victoria. Rated by the government as Australia's best reptiles. No one else gets as many unsolicited testimonals as Snakebusters. Typical "Short" testimonals can be found here. But, perhaps the best testimonial we have is the fact that people who book us once, tend to want us again. People don't like to take risks with "Unknowns" making false claims, or second-rate outfits. In other words if you see Snakebusters at a venue one year, it's odds on that if the event runs again, we'll be booked in again. This also gives you an idea as to where you can find us. (Also see the link for upcoming events and appearances). We have way too many references and testimonials to put onto this website, (server space limitations), but can send some to you if need be. Several typical examples appear in the pdf file linked below. PDF File of several testimonials.